I have some hesitations about posting this right smack in the middle of summer, since saffron is so very much a christmas spice here in Sweden, but really, don't let that deter you from making these delicious truffles. I also know that many people aren't very fond of white chocolate. Well, I'm not one of them, and apparently, neither are any of the girls here at work because they scarfed these down like crazy when I brought them in for our morning coffee. I don't think I've ever had so many beg me for a recipe! So - I'm pretty confident about these. They really are easy to make, and they're totally delicious. Even in the summer. Finely chop the chocolate and place in a bowl. Mix cream, honey and saffron and bring to a boil. Add this to the chocolate and stir well until it's melted. Place in the fridge to cool and to firm up. It needs to be pretty stiff before you can roll it. 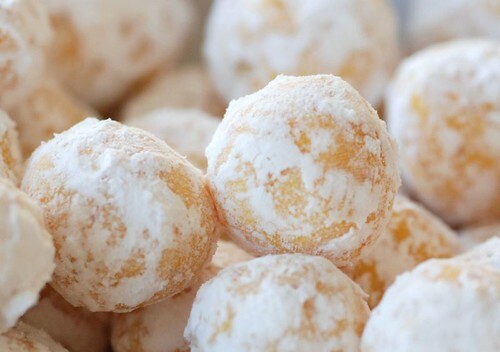 Shape small balls and roll them in powdered sugar. I then placed mine on a baking sheet and froze them for a few minutes, and then I just kept them in a bowl in the fridge. They kept very well! These sound heavenly, Anne. Which brand of white chocolate did you use? Saffron and cardamon make wonderful white chocolate truffles - yum. Wow! Sounds incredible! I agree with the use of saffron at Christmas, but these are going on my list of things to make at home on the holidays! Those look amazing :) I LOVE white chocolate! Did you use saffron powder, or stamens? They look great! Foodycat, I don't know what stamens are :) I used regular ground saffron, nothing special about it. What a nice blog! But I'm not sure if it was a good idea to visit the site or not. ;) You are doing a great job with it either way. wow, saffron & white chocolate!! that is so unique and original! is this a common combination in sweden?? I must try it out! Absolutely amazing! what a genius combo idea! I hadn't visited in quite a while, but how could anyone pass up white Chocolate? The Saffron is a fun and thoughtful addition too. What a great idea! I'm always looking for new ideas and this is certainly original! If you're looking for a great white chocolate try El Rey from Venezuela. Truly delicious! Well, the saffron is really the point of these. One envelope here - which is enough for these truffles - costs about 25 SEK, more or less depending on the year. It's expensive, but not outrageously so. It's a very popular spice for christmas here in Sweden, so that's the only time I'd use it. Saffron truffles were one of the highlights of my month in Sweden at Christmastime. I love these sublime treats, and am so glad you posted them!